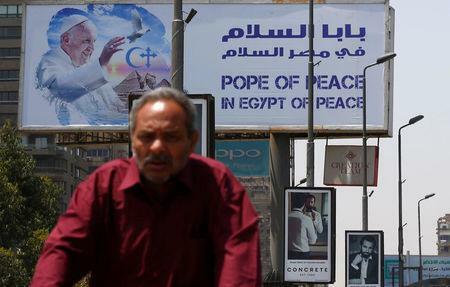 VATICAN CITY (Reuters) - Pope Francis hopes to mend ties with Muslims on his trip to Egypt on Friday but faces criticism from church conservatives for meeting Islamic religious leaders after a spate of deadly attacks against Christians. In a video message to the people of Egypt on Tuesday, Francis said the world had been "torn by blind violence, which has also afflicted the heart of the your dear land" and said he hoped his trip could help peace and inter-religious dialogue. Security is a primary concern less than three weeks after 45 people were killed in attacks on Coptic Christian churches in Alexandria and Tanta, claimed by Islamic State, on Palm Sunday. But Francis has insisted on using an ordinary car during his 27 hours in Cairo, continuing his practice of shunning armored limousines in order to be closer to people. Francis will meet President Abdel Fattah al-Sisi; Sheikh Ahmed al-Tayeb, the Grand Imam of al-Azhar, the world's most influential center of Sunni Islamic theology and learning; and Pope Tawadros II, head of the Coptic Orthodox Church, who barely escaped the Alexandria bombing. Sisi declared a three-month state of emergency after the attacks. A main reason for the trip is to try to strengthen relations with the 1,000-year-old Azhar center that were cut by the Muslim side in 2011 over what it said were repeated insults of Islam by Francis's predecessor, Pope Benedict. 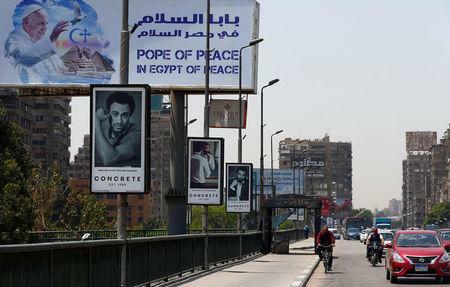 Ties with the center were restored last year after Tayeb visited the Vatican. Tayeb, widely seen as one of the most moderate senior clerics in Egypt, has repeatedly condemned Islamic State and its practice of declaring others as apostates and infidels as a pretext for waging violent jihad. The Vatican says that Francis, who denounces the idea of violence in God's name, is convinced that Christian-Muslim dialogue is more important now than ever. Papal aides say a moderate like Tayeb would be an important ally in condemning radical Islam. In Tuesday's message, Francis said he hoped the trip could bring "fraternity and reconciliation to all children of Abraham, particularly in the Islamic world, in which Egypt occupies a primary position" and "offer a valid contribution to inter-religious dialogue with the Islamic world". The pope's views are not shared by all Catholics, however. Some conservatives say there should be no dialogue with Islam and that a "war of religion" is in progress. Italian historian Roberto de Mattei said the Palm Sunday attacks should be "a brusque reality check for Pope Francis". The perpetrators were "not unbalanced or crazy but bearers of a religious vision that has been combating Christianity since the seventh century," De Mattei, editor of the conservative monthly magazine Christian Roots, wrote in an editorial. Novus Ordo Watch, an ultra-conservative Catholic blog, blasted the Vatican over the logo of the trip, which displays the Muslim crescent and the cross together, and derided the pope as "Mr. Coexist". A leading Catholic scholar of Islam, Egyptian-born Father Samir Khalil Samir, said that Francis meant well but was naive. "I think his ignorance of Islam does not help dialogue. He has said often that we know that Islam is a religion of peace but this is simply a mistake," Samir, who is based in Beirut, told reporters in Rome. "We know there are certainly times of peace and a willingness for peace on the part of many Muslims but I can't read the Koran and pretend that it is a book that is oriented towards peace," he said. The region has witnessed a massive exodus of Christians fleeing war and persecution in the past few decades, accelerated recently by the rise of Islamic State. Francis said in his message he hoped his visit could be a "consolation and ... encouragement to all Christians in the Middle East". He will visit Cairo's largest Coptic cathedral to pray for the 28 people killed in a Christmas season blast last year and lay flowers in their memory. 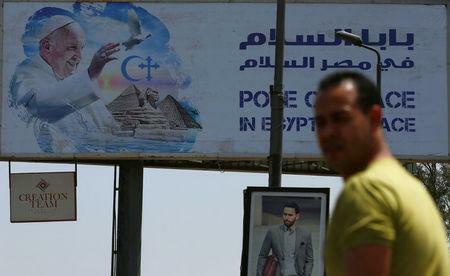 Rights activists are concerned about the pope's meeting with President Sisi. Sisi has sought to present himself as an indispensable bulwark against terrorism in the region, deflecting Western criticism that he has suppressed political opposition and human rights activists since he was elected in 2014. Asked if the pope would raise human rights concerns, Vatican spokesman Greg Burke said Francis had made "trips more delicate than this one," adding "let's see what the pope has to say."